For an all too short period in 2017, a Wolfman was available directly from the manufacturer without any wait list or lotto system to navigate; this was the Guerrilla model. 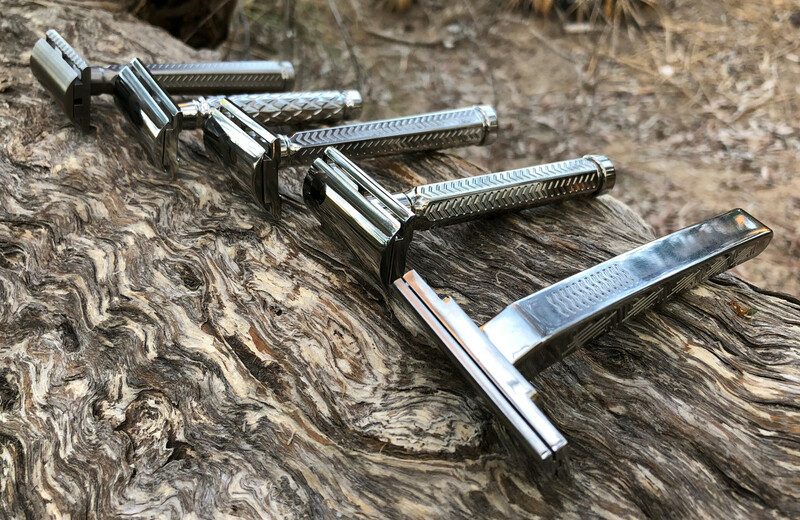 A stainless steel razor available with both safety bar and open comb options; the Guerrilla was a less expensive option that missed out on the detailed satin or polished finish of its big brother the WR1. It has a machine finish that is very well executed and equal to that of many manufacturers satin finish. Of course I never purchased the open comb model while they were available but was lucky enough to be supplied one from Wolfman while there was still stock remaining. Typical of a Wolfman razor all excess metal has been removed from the head. The hollow handle is the controversial part of the razor and that is mainly because of the lack of any provided grip. With dry hands I never experienced any difficulty but throw a bit of water and lather into the mix confidence in the handle’s performance becomes problematic. It’s no wonder that many users have changed the handle for one with more grip. After the first shave I could not believe how mild the razor felt, maybe coming from a razor with a lot more efficiency had led me astray. However, the second and subsequent shave felt a lot more like I remember of the Guerilla and was very similar in feel to that on the Karve BC on #C plate. All shaves were super smooth and very close so there were no complaints from me. I enjoy your reviews Errol. 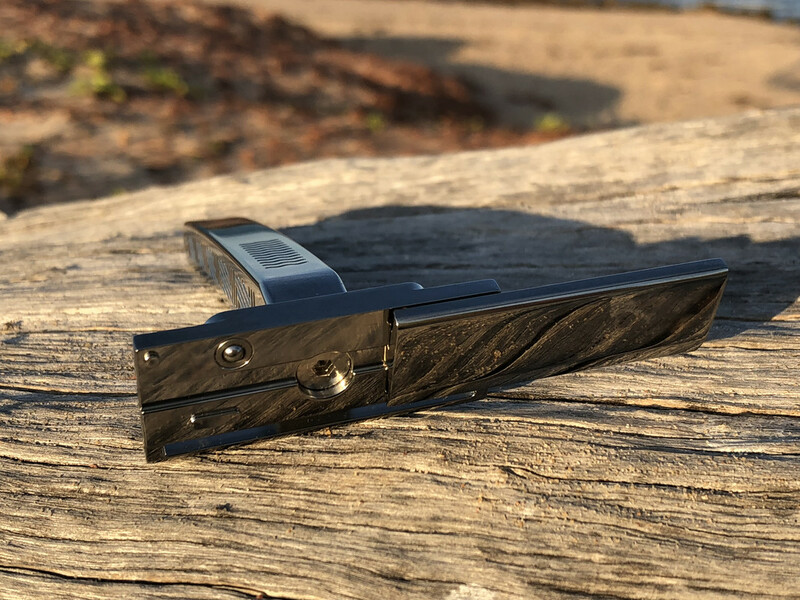 I'm going to order my first modern adjustable razor that features base plates; which if you haven't seen my post I made the other day; it's going to be the Rockwell 6C. In my mind it's a great place to start then move up to the more number of plates for adjustability. My advice is to purchase now. On Saturday I’m going to try and tempt you away from that decision with the Razorock Game Changer. Anyone interested in a Rockwell should also head to ministry of shave for 10% off! What do you mean tempt me away from that decision? I was among the first to lay down my money when this razor was released earlier in the year and managed to secure one of the original Game Changers without the groove in the back of the plate. My second Game Changer recently purchased has the groove in the back of the plate. The groove is purely aesthetical and the advertising literature advises that there should be no difference to the shave between the two plates. I did not plan on testing the Game Changer till later but the release of a #.84 plate (grooved) spurred my interest in trying both plates. I chose the first razor with the non grooved plate and fitted with the Radio Knob Handle. The Game Changer is machined from stainless steel and has been machine polished to a very presentable condition. The workmanship on the razor may not be up with the likes of the RAW, Timeless or Wolfman but it is certainly very acceptable. Using the standard #.68 plate the razor produced a smooth but not a real close shave akin to that delivered by a Karve CB #B plate. I’ve long accepted that there is no relationship to plate designations between manufacturers but was a little surprised just how mild the Game Changer #.84 plate was with the Treet blade fitted; very much like a #Karve CB #C plate. Inserting the Feather blade to the #.84 plated Game Changer produced a real upgrade in performance. Only once before (and that was with the Colonial General/ Feather Professional Blade) have I had a shave where I held all the aces and I had what I’m calling a dream shave. The Game Changer #.84/ Feather combination just glided over the face, any hint of aggression/ efficiency totally disappeared and a fantastic shave was delivered. Using exactly the same ingredients as the previous shave the final shave was not a dream shave but was very good just the same. This razor delivered as good a shave as I’ve experienced with any DE razor. I recommend this combination to everyone. Final word – #.84 plate and Feather blade; Wow. The #.84 plate makes the razor. My biggest hurdle is getting over the price Italian Barber charge for postage. More than the cost of the plate, I did purchase two plates but that is still virtually nothing. It did come in a box where a padded envelope should have done the job at a fraction of the cost. Wonder if vshod would do just the head? A unique razor. The MinGoose utilizes an injector type single edge blade in a three piece razor platform therefore the width of the head is considerably reduced when compared to a double edge razor and there is an even greater reduction on an Artist Club blade width. Manufactured from stainless steel, the head is matt finished and the handle is machine polished resulting in a very attractive unit overall. Deep spiraled knurling on the handle provides a very good grip even when wet. Fitting a blade into the razor is a similar procedure to that used for most three piece razors. 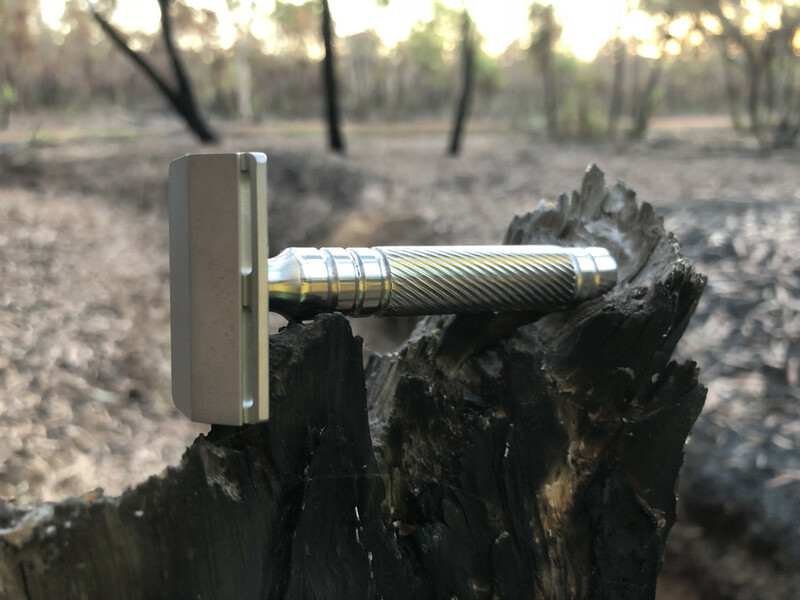 The MinGoose shave is a bit hard to describe and this is probably because it’s a mid efficient razor (Karve CB #C plate, plus) using a particularly sharp blade - initially. The head is best described as blocky and with the narrow width its comparative weight is quite high. The first shave was very close, too bloody close in fact and I ended up with a couple of bad cuts. As the blade had dulled a little the second shave was a little better but I did manage to open up the weepers from the first shave, blood everywhere. While I did not have razor burn I had that feeling that uneasy feeling that it was not far away. I was going to change the blade out after two shaves but decided to leave the blade in. Bad mistake, the blade had, by that time, seen better days and it pulled and tugged its way through its third shave. New blade, gently, gently, no pressure, let the weight of the head do the work and the razor worked really well. After the fourth shave I was not only enjoying the razor, I was amazed at how well it performed as I continued to get exceptionally close shaves. It just took a while to work everything out. Final Word – It’s different but it does deliver. The reason I’ve been using the Karve as a reference is quite simple really. 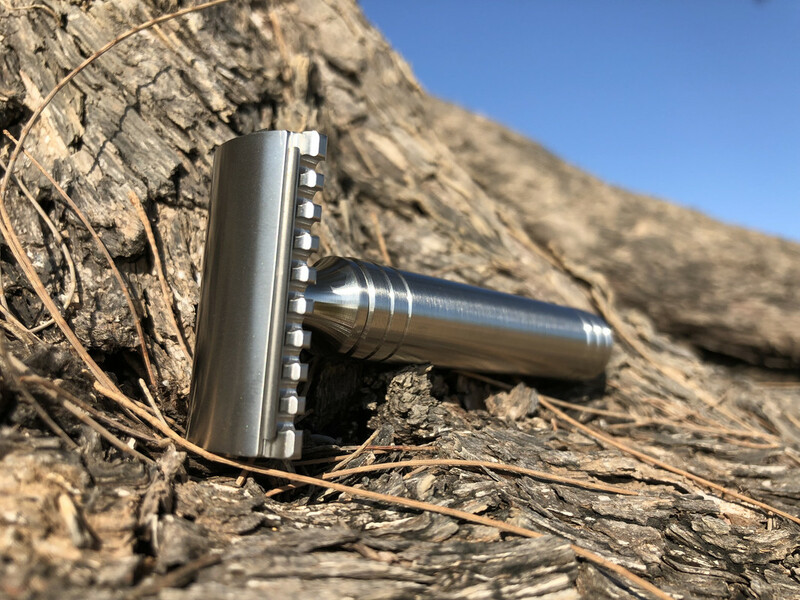 To start with it is an extremely good razor, there are seven different levels of efficiency available, the levels are evenly spaced and many on the forum use one. I simply use the Karve as my standard rather then comparing to another razor that is not as popular. For example, if I said it shaved just like a Darwin about three people on the forum might know what it was like. You going to update your rankings? 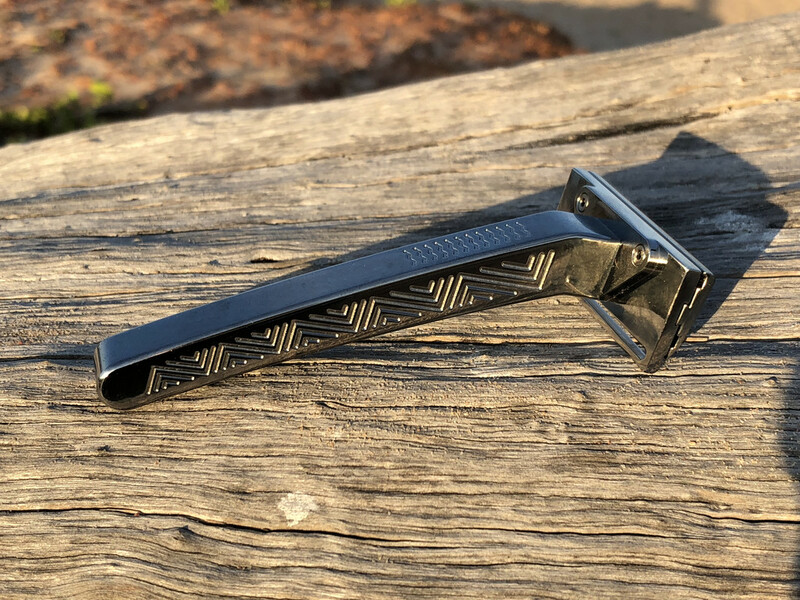 The Titanium SE is Paradigm’s first entry into the single edge razor market. Already owning an example of each of the four previously releases from Paradigm Razors it was inevitable that a Paradigm SE would end up in my hands. In recent times, I cannot remember a razor that has had so much negative press on release with most of that negativity is aimed directly at the handle. While different, I cannot say I dislike the handle but admit that it could possibly have been better shaped. There is a small finger grip section at the top of the handle along with those weird indigenous art looking markings along both sides. 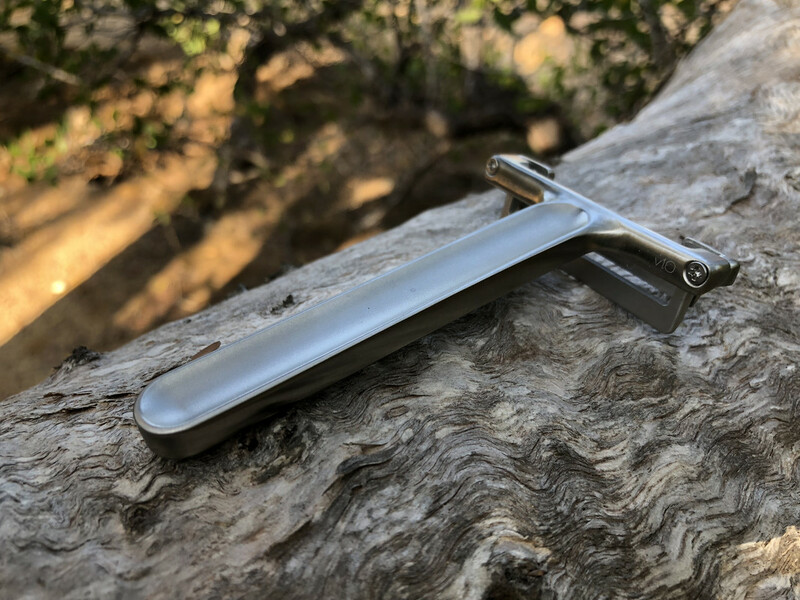 This is a two piece razor manufactured from titanium and then highly polished. Even though it has been polished over, evidence of tooling marks are clearly visible on the plates section once the cap is slid sideways, not what I would have expected from a razor of this eminence. What would be the plate on a three piece razor is actually screwed to the handle by a centre screw thus becoming a two piece unit. The cap itself slides sideways into position and is retained by two spring loaded balls that are mated to shallow indents in the cap. After only a couple of test loadings a line from the balls is clearly visible on the underside of the cap. I found the Titanium SE to be a very comfortable and manageable size. The radius in the handle sets a very shallow angle for the blade against the face. Let me tell you though that angle works with the Paradigm. The Paradigm delivers a silky smooth shave while being very efficient but without any blade feel. The delivered shave is second to none and there is never a hint that the razor is going to bite. Its performance is just so disciplined as to being pleasantly boring. There was no change in manners between the two blades I used; it seems to just get on with the job at hand. It is difficult to compare the efficiency of a single edge razor with that delivered by a double edge but I’m going to say the efficiency of the Paradigm is similar to a Karve CB #C plate. I thought the square sectioned handle may have limited the way the razor is presented against the face but this was never the case. I never identified that the handle was much different to any other quality handle while being used. I haven’t used the original Occam V1 and already the V2 is available so I’d better have a look at the original before I get too carried away with the V2 or O.R.E.N as Occam calls it. I have certainly checked out the replacement O.R.E.N but have not had the two Occam offerings side by side for comparison. The Occam SE is manufactured from stainless steel with mine having a matt finish. 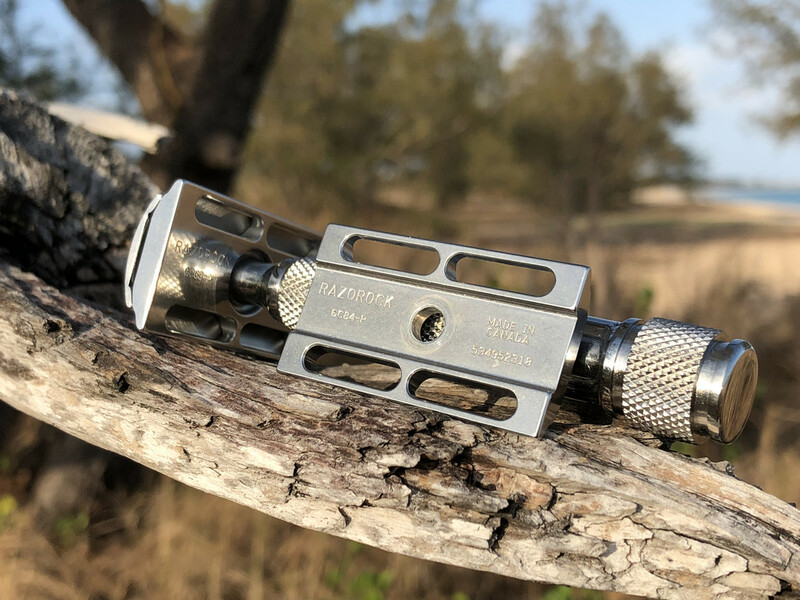 Occam has designed what is virtually a one piece razor that is able to have plates changed for three different levels of efficiency. The Occam comes standard with the two dot plate fitted and I doubt I’ll require the three dot plate but a change to the one dot plate is quite on the cards. A screwdriver is required to disassemble and change plates. When you look at the razor it is very minimalist and skeletal in design. I actually thought I’d lost a part of the razor because there did not appear to be enough parts to hold the blade. In actual fact when the blade is fitted it just floats around with nothing other than two small knobs to clamp it securely in position; we’ll see. The handle is rectangular in section with a wide groove running down its length on the two wider flats. A special hook tool is supplied to assist with changing blades but changing the blade can also be done without using the tool. Well I’d be a great forecaster in determining razor efficiency before actually trying it out; my first shave with the Occam using the Feather Professional was about equal to the Karve CB #C plate so I decided to change to a three dot plate for the next shave. With the three dot plate fitted the efficiency went to somewhere under that delivered by a Karve CB #D plate. I never felt there was any detriment to the shave by having a floating blade even if there is a blade rattled while in use; if I’d not inserted the blade myself, I’d never know it was not firmly secured. Talking of fitting blades, I had trouble inserting the Schick blade but eventually it seated on the two locating knobs. Determining the position of the blade with a large flat shaving face is difficult when shaving in the tighter areas like under the nose. Extra width is added to the width of the AC blade head because of the screws that secure the plate are outside the AC blade channel. This makes the head very wide and it is certainly noticeable and at times cumbersome in use. Unlike the Paradigm SE where the square sectioned handle felt right the rectangular sectioned handle on the Occam was at times a limiting factor and it sometimes felt uncomfortable to hold firmly. Final Word – There’s plenty of room for improvement.